Sky Go is an online television service from Sky which launched in January 2006. The service allows users to watch live and on demand video content from their Mac, Windows PC, mobile phone or Xbox 360 via a broadband or Wi-Fi internet connection. On demand content comprises sports highlights, latest news, movies and TV programmes. Content is viewable for a limited amount of time and is protected by digital rights management software provided by Microsoft and the NDS Group, and therefore cannot be copied to disc or viewed beyond the date carried by its license. The service is available at no extra cost to existing Sky TV customers, with accessible content depending on the subscriber’s Sky package. Non-Sky TV customers can access the service by subscribing on a pay-per-view basis. Sky Go is viewable on up to two devices. The Microsoft Silverlight 3.0 browser plug-in is required to play content on computers. 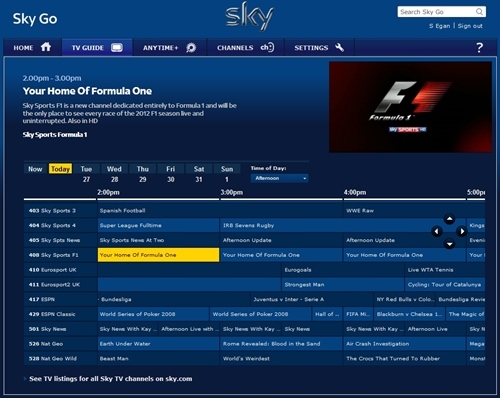 Due to viewing rights, certain programmes are not available to watch via Sky Go, and are ‘blacked out’ from the schedule. In order to have access to the full selection of live TV channels available on Sky Go, users will need either a Sky Multiroom or Sky Broadband Unlimited subscription, on top of the required TV packages that correspond to the available channels. Watch Sky TV programmes live and on demand – instantly in your web browser on PC or Mac. Firefox, Safari and Internet Explorer browsers are all supported. Watch great TV and Movies from Sky wherever you are. Watch in a second room without a set top box, on your laptop or your PC at work. If you have Microsoft Windows 7, you can access Sky Go and watch TV from Sky in Windows Media Center. There’s more than one way to watch Sky Go on your TV. You can now watch TV from Sky on your Xbox 360 and bring Sky Player to your TV. Plus watch live TV with your friends who also have the service in Party Mode. Plus many computers and laptops now have a TV out (S-Video or HDMI), so you can just connect the relevant cable to your TV and bring Sky Go into the living room. To get the best viewing experience with Sky Go on your computer, you should check that your PC/Mac meets the technical requirements listed below, If you are not sure about your computer’s technical specifications, you will be able to find these in the manufacturer’s handbook that was provided with your computer. If you have Sky Go Desktop installed on your computer, you will need to make sure you have enough free space on your hard drive to download content. The amount of disk space needed will depend on the number and file size of the videos you wish to download. The file size of each video can be found on the page you start the download from, so you can always check before downloading. To check how much space is on your hard drive, select the tab that most closely matches your hardware and follow the steps relevant to your operating system under the Sky Go Desktop heading. 1. Open the Start menu on your Windows menu bar and select My Computer. 2. Right click on the drive labelled C: and select Properties. 3. Your free disk space will be shown in the General tab. • Macintosh (Intel-based) Intel Core Duo 1.83-gigahertz (GHz) or higher processor with 512-MB of RAM. 1. Right-Click on the Hard Drive icon on the desktop – this can normally be found in the top right hand corner of the screen. 3. Under the General Info arrow, you’ll see the available Hard Drive space in GB (Gigabyte), with the total capacity displayed directly above. You can install Sky Go Desktop on your computer by doing the following: 1. 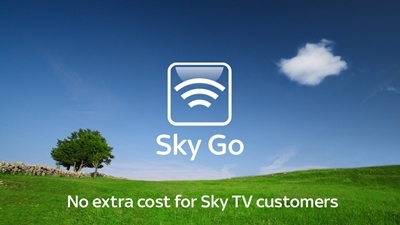 Sign in to Sky Go using your Sky iD and password. 2. Select the Settings menu located near the top right hand side of the page. 3. Select the option Install Desktop Software from underneath the Sky Go Desktop heading. 4. You will be asked to confirm that you want to install the software. Your installation will proceed once you have confirmed this. 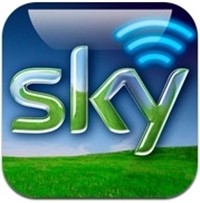 Sky iD Account To use Sky Go, you need a Sky iD account. It is quick to set up and will give you access to a whole range of other Sky websites and services. Go to: www.skygo.com to set up a Sky iD account. To open Sky Go Desktop, simply double click on the Sky Go Desktop icon on your desktop, or select Sky Go Desktop from your Start Menu. If you’re using a Mac, you will be able to find Sky Go Desktop in the dock at the bottom of your screen. To download a programme with Sky Go Desktop, sign in to Sky Go Desktop and find the programme you would like to download from the Sky Anytime+ section*, then select Download on the right of the page. The programme will be added to your download queue, and will be ready to watch as soon as the download has completed. To check on the status of your programme downloads, select My Downloads at the top of Sky Go Desktop. From here, you can re-order the download queue, pause all downloads and/or select the option to allow multiple downloads, as well check the progress of programmes currently downloading. You can set up a queue of 32 programmes to download, and see an indication of when this queue was last checked. Sky Go Desktop uses the same playback technology as the Sky Go website to download TV programmes to watch offline on your main computer, so you can enjoy the best viewing experience, even with a slow internet connection. You can queue up to 32 programmes for download at any one time, and your queue will be automatically checked roughly every 10 minutes. The time your queue was last checked is displayed in the footer of the Sky Go Desktop window. If you want to check for new downloads before the next automatic check, simply select the ‘Check Queue’ option. Note, you need to fully download a particular programme before you will be able to watch it. When you download a programme with Sky Go Desktop onto your computer, they will be stored in a folder labelled Sky Go. If you are using a Windows-based computer, this will be found in the My Videos folder. If you are using a Mac, it will be located in the Movies folder. You should only delete any programmes from these folders if you are certain you don’t need them anymore, as you won’t be able to watch the programmes again through Sky Go Desktop without re-downloading the content. You do not have to manually delete any programmes you have downloaded through Sky Go, as programmes will be automatically removed from your computer when your license to watch them has expired. However, if you want to delete programmes you have already watched to free up disk space on your computer, you can do so by accessing your downloads list in Sky Go and pressing the x icon alongside the programme. Go To watch programmes you have downloaded with Sky Go Desktop, make sure the programme has downloaded completely then press the Play button that appears over the programme image. To watch the programme in full screen mode, select the fill screen icon to the right of the progress bar. You can exit full screen mode at any time by pressing Escape on your keyboard, and if you want to return to your list of downloads, press stop. When watching a programme on Sky Go Desktop, you can pause your viewing and resume viewing as long as you don’t close the viewing window. If you need to turn off your computer when stopping watching a programme, ensure you make a note of how far you were in to the programme, as you won’t be able to pick it up from where you left off when you re-open Sky Go Desktop. The same Parental Control settings used on the main Sky Go website are enforced by Sky Go Desktop. This means that you must be online and signed in to watch programmes that are restricted by your Parental Control settings. If you update your Parental Control settings on the Sky Go website you need to make sure you sign in to Sky Go Desktop to update your offline settings. Sky Go has the option to set parental controls based on the familiar age rating certifications. To choose your parental control level, enter the Account and Settings section on the Sky Go website and choose Parental Control. You will then be asked to enter the PIN you set up when you registered. You can then choose the parental control level you require. There are three options available: 1. No parental controls, this is the default setting. 2. Restrict films based on their certification (i.e. 12, 15, 18). If you restrict a classification all others above this will also be restricted, e.g. if you restrict 15 rated films, you will be asked for your PIN to view 15 and 18 rated films. This will only apply to films watched through Sky Go and will not apply to movies viewed on your computer using another media player. 3. If you select ‘Disable offline viewing’ you will be asked for a PIN to watch any film and you will have to be connected to the internet. This will stop any movies being watched through another media player. Please note if you change your Parental Controls the new level of restriction will not apply to any movies that you have previously downloaded to your PC. To choose your PIN, access the Settings section at www.skygo.com and choose “update your registration details,” to bring up your Sky account details. Enter your new PIN then select Update. If you forget your PIN, or wish to change it, select Settings then follow the “update your registration details” link to bring up your Sky account details. Enter your new PIN then select Update. If you have recently changed your PIN and get a message advising that your PIN is incorrect please try your old PIN. The next time you use Sky Go your PIN should be updated. To be completely sure that no-one can watch any movies of a certain classification we recommend that you disable offline viewing. To make your PIN effective, try to use one that others will not be able to guess easily – don’t use your birth date, for example. Change your PIN every so often, just in case someone has learned it, or if you have shared it with someone else in your household and wish to restrict their access again at any time. 1. My Downloads – The main Sky Go Desktop window, with your download queue and available programmes. 2. Open Website – Opens the Sky Go website in a new window, where you can select programmes to download to your computer. 3. Help – Summary of the main Sky Go Desktop controls. 4. Sign in – Click to sign in while online and your download queue will be checked for programmes you have chosen to download from the website. 5. Programme Image – An image of the programme that is currently selected. 6. Programme Details – Details of the programme currently selected. 7. Play – Once programmes have been fully downloaded the Play button will appear over the programme image. Click to watch the video even if you are offline or not signed in. 8. Downloading – Displays only downloads in progress, or recently completed. 9. List All – Displays downloads currently in progress, as well as completed downloads that are ready to play. 10. Check Queue – Manually check for any new programmes you have queued for downloading. 11. Pause All Downloads – Pauses all active downloads. 12. Allow Multiple Downloads – When the box is checked up to 4 downloads can be active at the same time. 13. Expires – The time you have left to watch the downloaded programme before it expires. After this you can still download it again, subject to availability. Rental programmes will charge for subsequent downloads. 14. Pause Download – Pauses the downloading of individual programmes. Once paused the next inactive download in your queue will start automatically. 15. Start Download – Will start, or restart, the download of individual programmes. 16. Delete – Removes the download from your queue and deletes the downloaded programme from your computer. 17. Download Status – Shows whether the download is currently Downloading/Downloaded/Paused/Error. If the status is ‘Error’ you will need to delete the download from your queue and download it again from the website. 18. Download Progress/Percentage Complete – Shows the percentage of the download that has completed. 19. Queue Last Checked – Shows when your queue was last checked for new downloads. You need to be signed in to check for new programmes you have chosen to download from the Sky Go website. Take Sky Sports on the move with the new Sky Go app. Get more from Sky Sports with the new Sky Go app, which gives Sky TV customers with Sky Sports 1 & 2 access to all five Sky Sports channels wherever they are in the UK and Ireland for FREE on Android, iPhone, iPad or iPod touch. What’s more, Sky TV customers with Sky Movies 1 & 2 can enjoy the latest movies on Sky Premier as well as Showcase, Action and Adventure and Family – all on the go and at no extra cost. With Sky Go you can register up to two devices and watch on both at the same time wherever you have a 3G or Wi-Fi connection so you needn’t miss the Friday night premier or that all important deciding goal. Sky Go is available on Android devices and iOS 4.2 or above including iPhone 3GS, 4, 5, 5S, iPad 1, 2, 3, 4, Mini, iPad Air and iPod touch 4th and 5th generation. If you are a Sky Go Monthly Ticket customer you’ll also get access to the Sky Go app. All you need to log-in and start enjoying Sky Go is a Sky iD username and password which you can set up at skygo.com/signup. Signing up is quick and easy and you’ll be watching on the move in minutes.